These before and after photos were taken at a Tampa FL residence after some minor flooding had occurred in the home. The home owner was having problems with water seeping up through her home's concrete foundation. Spots began to get heavily soiled, especially in the high traffic areas. 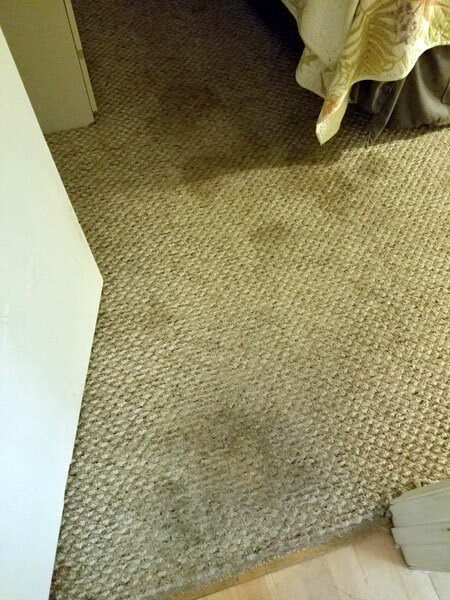 With regular cut fiber carpet water seepage can be a problem. 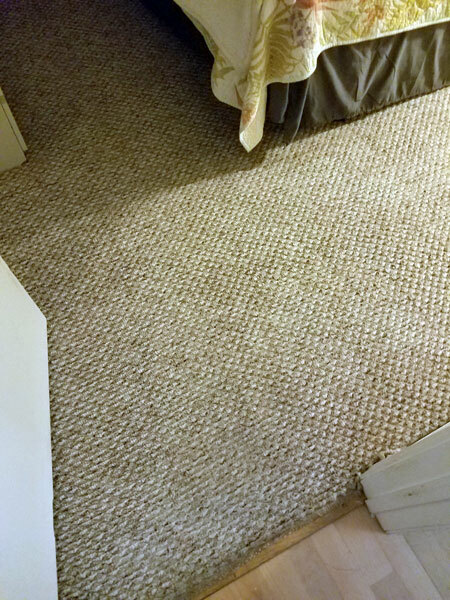 When the carpet is loop fiber or berber style carpet it can be a down right disaster. This is not your normal carpet cleaning situation, so this is how to deep clean carpet using Chem-Dry's hot carbonated extraction cleaning solution. Most steam cleaners approach this type of staining by pre-treating the soiled areas and then use hot water to extract the loosened soil. In most cases this will remove the spots and traffic lane grey, but then the carpet and pad underneath are soaked and the home owner is back to where she started in the first place. A carpet that has been over wetted and prone to soiling quickly. Here's where Chem-Dry of Tampa FL excels. Using hot carbonated extraction the carpet is cleaned with one fifth the moisture of hot water extraction and the carpet dries quickly. Hot carbonated extraction is more powerful of a cleaning system that uses microscopic bubbles to rip dirt and soil from the carpet fibers without over wetting the carpet. The carpet pad underneath doesn't even get wet. So if your trying to figure out how to deep clean carpet without having to soak it and risk the spots coming back. It might be time to call Chem-Dry of Tampa. For a deep carpet cleaning in Tampa FL call Chem-Dry of Tampa.